'land that all men desire to see, and having seen once, by even a glimpse, would not give that away for the shows of the rest of the world combined.' - said Mark Twain, having been captivated by the beauty of Darjeeling. The Darjeeling Himalayan Railways - What is so special ?? 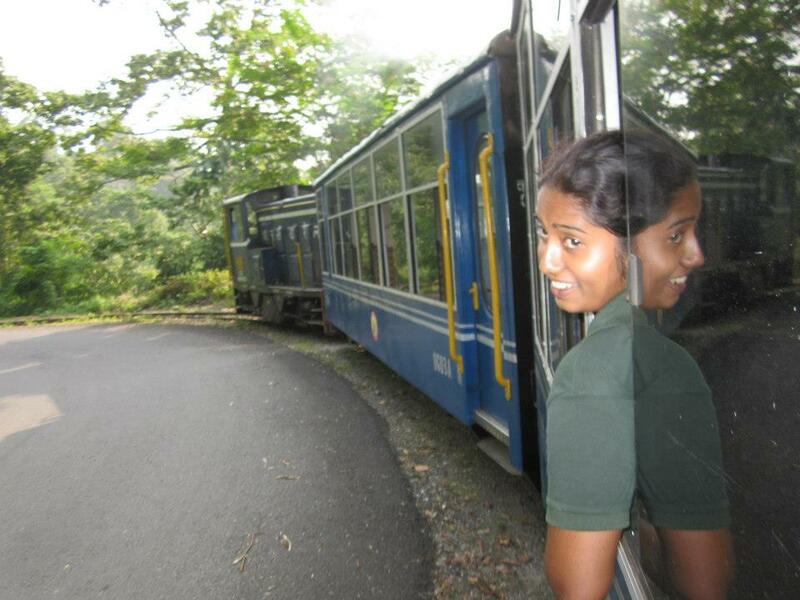 The Darjeeling Himalayan Railways, a 2ft narrow gauge train that travels from Siliguri to Darjeeling. This 78 Km journey ascends from 330 ft at Siliguri Jn. to Darjeeling at 6700ft with Ghoom being the highest point at 7407 ft. The entire pictursque journey can take about 7.5 hours to complete in its entirety, but one can also travel between the interim stations. This is a terrain that is one of the steepest to cover even in the road today for the uninitiated and I have seen the shared taxi drives, most of whom are Gurkhas with great admiration at their ability to maneuver the wheels there. The Darjeeling Himalayan rail route covers some of the beautiful ghat section, and a variety of scenery from the tea gardens, deep forests, valleys and even the local mandi or markets. The Darjeeling Himalayan Railways was the first hill railways to be established in India and only the second in the world as far back in the 1880's. The Darjeeling Himalayan Railways has been declared as a UNESCO heritage site in the year 1999, the first railway line in India and only the second in the world to attain such a distinction. The construction of the Darjeeling Himalayan Railways was initiated in 1879 after a feasibility study. Gillanders Arbuthnot and company (later known as Darjeeling Himalayan Railway Company)which was given the contract completed the construction at an amazing speed. The stretch between Siliguri to Tindharia was open by March 1880, Kurseong in Aug of the same year and the track till Darjeeling was completed and inauguarted on July 4, 1881. The Rail route follows along the Hill Cart Road in most places except in places where it was apparent the steepness of the road was much more than what the locomotives could maneuver easily. Venerable Engineering innovations has been done to make this huge geographical challenge a possibility to link through the railways. To overcome this a number of innovations by means of Loops and Zig Zags had been built in the route to ease the gradient to enable the locomotive to climb the slope. Some of these Loops have been replaced now with a wider route and some Zig Zags. The Darjeeling Himalayan Railways has a very sturdy design and has withstood many cyclones and Earthquakes. Today it is possible to cover the distance between Siliguri and Darjeeling in about 3 Hrs, by road in contrast to the 7.5 hrs train journey that it may take, however this will be one of the rewarding journeys that are atleast as beautiful as the destination. It is surprising that Jungle Safari is not as popular as it counterpart Joy Ride. This could be because siliguri is not exactly a tourist spot like Darjeeling and is considered more of a transit point. But very little info was available, either offline or online and the private tourists organisations denied either such a ride existed or was trying hard to sell their own private trips in the guise it was the same. One of the tourists organisations, agreed to get us tickets at a premium of 50 Rs per ticket. But since we were very close to the station, we decided to drop by and check with the station master and were told the tickets can be got from the counter before the train ride begins. The other most surprising part was that the train coach was literally empty except for the railway staff !! The booking process has now been changed, and it is mandatory to book either online or prior in the counter to give them to prepare the charts. No Unreserved tickets are being issued currently. The Sukna station houses a museum, which are almost always closed and the train halts here for a very brief time to allow the passangers to explore anything but the neatly maintained yet ancient platforms of the station. The Loops and Zig Zags were ways in which the train manages the steep gradient and going through them astonished me not only the innovation and effort that had been done at the time of building the route, but the amount of manpower and maintenance required to run the rail on day to day basis. Zig Zags are places where the train changes tracks from one line to another. So the train go all the way down a track and once it crosses the juncture, the ground staff, manually change the bolts and tracks and ensures it is safely secured. Then the train goes in reverse gear (if you can imagine such a thing happening) either up or down and now starts travelling in the other track. There are two Zig Zags or Z reversals between Rong tong station and Tindharia. The train stops at Tindharia station for about 40 mins, to let it passangers take a break in the round trip, before it proceeds back to Siliguri Jn. The train always seems to stop just before the station in the Siliguri Market for sometimes, even hours together awaiting signal. Since this is the only train that uses the narrow gauge, it always bewildered me why the train stops at the signal for so long. The guard however encourages people to get down and leave, rather than wait for such a long time to go back into the station and which is what I ended up doing both times I took the trip. The toy train in Darjeeling, plies between Darjeeling and Ghoom a distance of about 7 Km. Due to the touristy nature of the place, the tickets are in heavy demand and require to be purchased much in advance either online in IRCTC or IRCTC tourism. This train stops at the Ghoom station for a while, and allows the tourists to explore the Ghoom Train Museum which holds a number of important artifacts inculding retired engine, Baby Sivok of the Darjeeling Himalayan Railways. The best part of the Joy ride is the Batasia Loop. Batasia Loop is a spiral railway constructed to lower the gradient ascent of the rail and now houses a memorial and a park. The Joy ride makes a 10 min stop at the Batasia Loop, providing great photo opportunities of the wonderfully manicured Garden and the majestic Kanchenjunga. The route is otherwise not as scenic as its less popular cousin the Jungle safari and which truly cruises through a jungle, this sadly walks in parallel with the roadways, bazaar and the urban jungles, leaving very little untouched nature to look forward to from the train. Although this is not the joy ride, in the sense not a round trip or extremely touristy focused trip, it is often used by the localities as well for transport of both people and goods. For travellers who enjoy local experience, this would serve a better and a truer local experience and is much cheaper as it contains only the second class cabins, unlike the all First Class cabins of the the other two trains. However this train does not make a stop in Batasia Loop and a very brief stop at Ghoom station unlike the Joy ride. While booking the 'Joy Ride' trains online, pls book source code as DJ and destination as DJRZ. These trains often run late. So please plan your onward journey carefully. It will not be possible for you to travel from Tindharia to Kurseong on road, as the roads have been damaged in landslide and are yet to be repaired. You will have to return to Sukna to catch a shared taxi for your onward Journey to Darjeeling.